Home Health Hey, Dads! Your baby isn’t well! Hey, Dads! Your baby isn’t well! There are some dads who are “babysitting” (How you can babysit your own child?) and are finding that it is an awesome responsibility. You are the person who now is obliged to shield your child from harm. Illnesses: Dads can too handle a sick child! Let’s talk about kids’ illnesses. Most fathers are distressed at the mere thought of taking his child to a physician, translating the problem with its solutions into English, and giving the child the right medicine at the proper time in the right dosage. Recognize minor illnesses you can handle yourself. Most childhood illnesses are minor and don’t require a doctor (or, an emergency room!). Things like splinters you know you can handle. An accident on the playground that results in a broken arm, take right to the hospital’s ER. You might not know it, but here are common illnesses you can treat at home. The website KidsHealth.org contains good children’s health information for the whole family. Here is a guide to three of them. Human parainfluenza viruses (HPIVs). This disease sounds terrifying, but it is actually a very common viral illness that causes cold-like symptoms. The child may have a cough, a fever and a runny nose. Kids usually get better on their own. Flu vaccines do not help, by the way. If their fever gets worse, they seem to have croup or pneumonia, call your doctor and explain the symptoms. Croup. Once you have heard a child with croup, the sound will stay with you forever. Croup inflames the voice box (larynx) and the windpipe. Kids are hoarse and have a barking cough. You can listen to here where you can listen to the sound of croup and read how to take care of your child. Croup is usually mild and can be treated at home. If they get worse, a trip to the ER is in order. Dehydration. Sometimes, when children have fevers, vomit, sweat or have diarrhea,their fluid balance is upset and they can suffer from dehydration. It is important that you recognize the signs immediately and rehydrate the child. 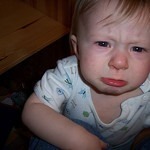 Babies may not have tears when they cry, have a dry or sticky mouths or urinate very infrequently with darker urine. Young babies may show a sunken fontanelle, the soft spot. Dehydrated children are usually lethargic and irritable. It is critical to rehydrate your child immediately. You can buy an oral rehydration solution (ORS) at the drug or grocery store. They contain recommended amounts of salts and sugars that replace the kind of fluid lost. Use the ORS over a 3 to 4 hour time frame, giving your child 1 or 2 teaspoons every few minutes with a spoon or oral syringe. This will add up to about a cup in an hour. Get to know the lay of the land. Know your child’s physician. Ideally, you should accompany your wife to several well-child appointments. You will get to know the doctor and she will get to know you. Also, your child will see you with the doctor and realize that you are working together. Know which hospital and pharmacy to use. Know which your family uses and where it is. These institutions have your insurance information, know who your doctor is, and has records of all medications your child has taken, illnesses that have brought them to the hospital before. This can save you valuable time. Be certain not to leave home without your insurance cards!